This is a full 2″ lift kit with evrything you need to lift and coil convert your Gen 2 Toyota Landcruiser 79 Series (VSC) including our Superior Monotube Remote Reservoir Shocks. NOTE: Exhaust mods are not included in this price and will have to added to the final cost, the exhaust will need the be modified from the rear control arm mount back. 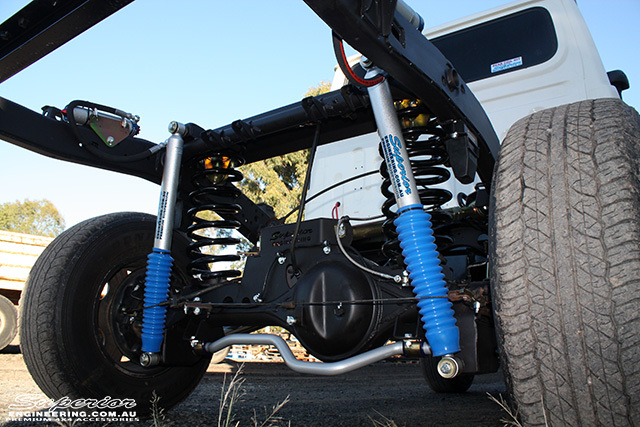 Convert your leaf sprung Landcruiser 79 Series to a more compliant ride and better handling both on and offroad with one of our Superior Engineering Coil Conversion Kits, designed, tested and manufactured right here in Brisbane to suit all Australian conditions. This kit is supplied with everything you need to convert your vehicle from leaves to coils. It includes all required parts such as all brackets, mounts, control arms, brake lines and swaybar as well. The NCOP VSB pre-approval paperwork is also supplied, so you can legally have the Coil suspension fitted and approved on your vehicle. The Coil Conversion kit utilises many original bolt locations to precisely place many of the brackets on the vehicle, allowing simple installation. 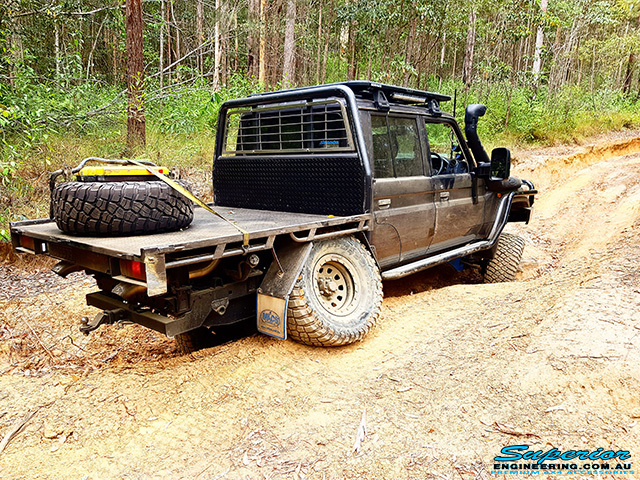 The Superior Engineering Weld-In coil conversion design was chosen to provide a more robust and longer lasting solution for the trusty Landcruiser workhorses. We felt that a welded package that distributes the loads more evenly over almost 100% more chassis area than common bolt-in systems is exactly what Landcruiser owners deserve! LESS Expense, Less Maintenance and improved chassis strength is why – Welding is the preferred method. Who would want to drive to the cape over corrugated tracks and have to stop to check if your rear suspension is still bolted in all the time? Once you drive on a coil rear 79 you won’t ever want to go back to leaf sprung suspension! Do your spine a favour, and get the Superior Engineering Weld-In Coil Suspension. We have developed this kit to be easy to install with full instructions and have done all the hard work and testing as well as performing accredited lane change tests (Check out the video below) and the Design pre-approval under the VSB LS Codes. This kit needs to be welded by a qualified boilermaker or welder (AS1554.1 certified) and fitted by a suitably qualified suspension fitter. Once this coil conversion is fitted the vehicle must be produced at your local transport approved modification plate officer, they will inspect that the vehicle has the suspension fitted in accordance with the supplied instructions and is welded correctly and to an acceptable standard, original invoice will need to be provided for the coil kit at time of inspection to prove it is a Superior Engineering kit . The inspector/ officer will then plate the vehicle with an LS6 approval code. As with all modification and aftermarket accessories, it is recommended to confirm all modifications in writing with your insurance company as some policies or providers may not accept such modifications although street legal. This kit is designed to use Toyota Landcruiser 80 Series Coils and Nissan Patrol Rear Shocks, which gives a great range to choose from. Please call us for advise on coil shock selection. NOTE: Maximum shock length must not exceed 785mm open. NOTE: Some modifications to the rear of the exhaust system will be required to fit this kit. Error: Error validating access token: Session has expired on Sunday, 28-Oct-18 16:20:22 PDT. The current time is Sunday, 21-Apr-19 23:36:21 PDT.